Nebraska, Texas, Stanford and Penn State are arguably the four most recognizable programs in Division I women’s volleyball that expect nothing short of a championship each season. There are several other teams that consistently earn national seeds, but there are always teams that challenge that thin line that divides a really good team and an elite one. Before the season begins Friday, here are seven teams that are on the brink of a breakout season and could be dark horse contenders to make a deep tournament run. Opening the season at No. 16, the Baylor Bears are on every team’s radar this year with three all-Big 12 performers returning following a 24-7 record and their best-ever finish in the Big 12 at 13-3. Last year’s Big 12 freshman of the year Yossiana Pressley is back to contend for a potential first-team All-American honor this year. Sophomore setter Hannah Lockin and redshirt junior middle blocker Shelly Fanning also will be catalysts for the Bears in their hopes of dethroning Texas atop the conference. To the team that beat Baylor in the second round of the NCAA tournament, the Colorado Buffaloes return three major players after reaching the regional semifinals for the first time in 20 years. A second-team All-American, Alexa Smith is one of the best hitters in the Pac-12 and benefits from having fellow senior Naghede Abu in the middle. Setter Brynna Deluzio was phenomenal as a freshman last year, ranking third in the conference in assists per set and leading the team in aces. Staying in state, the Colorado State Rams will challenge the Buffs as the best team in the state and will be a mid-major team that has weapons all over the floor. The Rams return four of five all-Mountain West players from last year, including player of the year Katie Oleksak at setter. The thing about the Rams, too, is that three of those returners are juniors and the other is a redshirt sophomore. They should run through the Mountain West again. Some might consider Illinois a top-tier program already, but after getting hot at the right time last year and with two of the best players in the conference returning, the Illini could contend in the loaded Big Ten this season. After beating No. 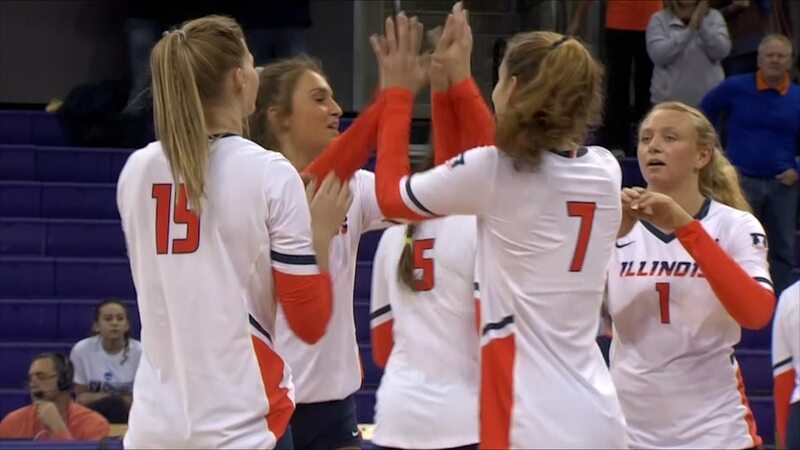 8 Washington in the second round of the tournament last season, seniors Jordyn Poulter at setter and Ali Bastianelli in the middle are good enough to carry the 12th-ranked Illini to a regional final. Possibly a year ahead of schedule last season, the Marquette Golden Eagles should challenge Creighton for the outright Big East title this season and be a dangerous team in December with nearly every major contributor returning. Allie Barber, the reigning Big East player of the year as a sophomore, will likely carry Marquette on the outside again along with conference freshman of the year Hope Werch. Jenna Rosenthal, a 6-foot-6 middle hitter, led the Big East in blocks per set. Setter Lauren Speckman is back for her junior year after averaging 11.61 assists per set last season. The Big Ten is so deep in talent that it’s not uncommon for a team to finish sixth in the conference and make a run to the national semifinals. Michigan did it in 2012 and has pieces in place again to be a surprise team. Third-team All-American and all-Big Ten outside hitter Carly Skjodt will do everything for the Wolverines in her senior season while leading a freshman class with five top 100 recruits. Michigan returning setter MacKenzi Welsh and freshman Erin O’Leary will compete all year with each other, but Skjodt’s play will largely dictate if the Wolverines can do better than last year’s first-round exit. We're back in action THIS WEEKEND! Following a 26-7 overall record and 18-2 conference record, the No. 20 Pittsburgh Panthers are the only ranked team in the ACC and are the runaway favorite to win their second conference title with all five all-ACC honorees returning. Pitt has its top five hitters returning, with Nika Markovich and Stephanie Williams leading at the pins, as well as starting setter Kamalani Akeo and starting libero Angela Seman. Reigning ACC coach of the year Dan Fisher has a team destined for a deep tournament run if it can avoid Penn State in the second round for a third straight year.